I live in a small town nestled in the foothills of the Catskills. Regardless of where you are in the town, if you are outside or look out a window, you can catch a glimpse of the beautiful hills. It’s a narrow valley, more like a bowl, and because of this, I can’t imagine living anywhere that lacks mountains or hills. There is only one true mountain (Bearspring Mountain) visible from the town, but the other hills are just shy of being true mountains. In a small town like mine, there aren’t many parks. Of the two parks we have, one is really small (gazebo and small playground), and the other is decent-sized but on the opposite side of town from where I live. Neither are really suitable for taking walks. My family lives near the county fairgrounds, so we often walk our dog, Maisa, there. 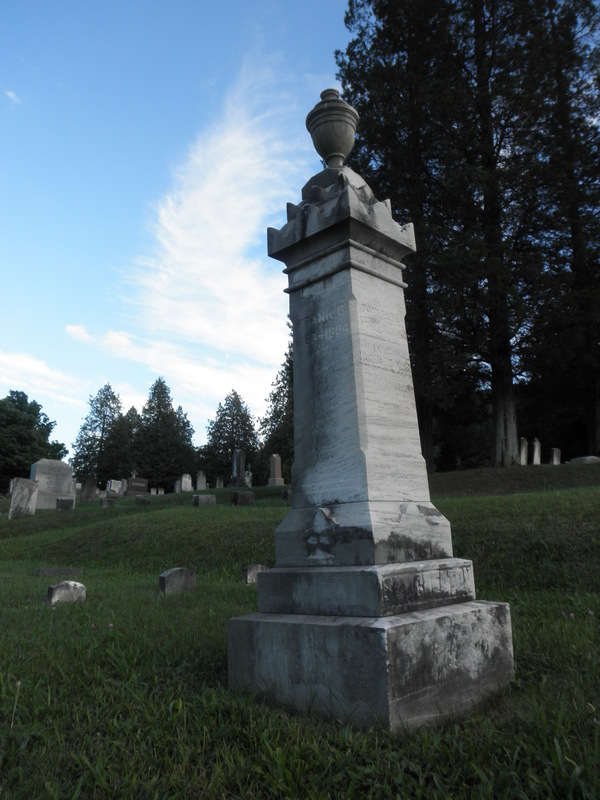 Lately, however, we have begun walking every night at the cemetery, which is just down the street. This may sound weird, but the cemetery is one of my favorite places in town. 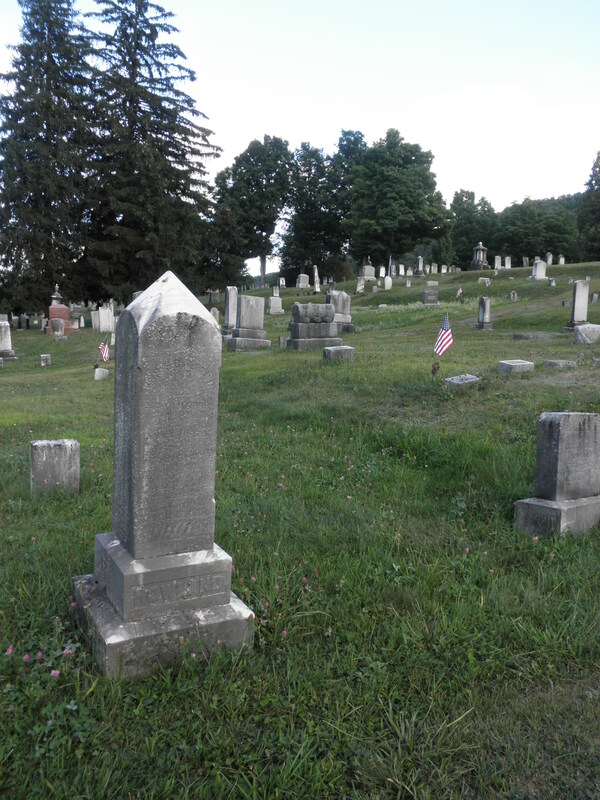 It’s a gorgeous cemetery, with plenty of old headstones, gently rolling hills, and old trees and flowering bushes. This summer, my mom, dad, and I have gotten into the habit of taking Maisa for a walk there every night after dinner. 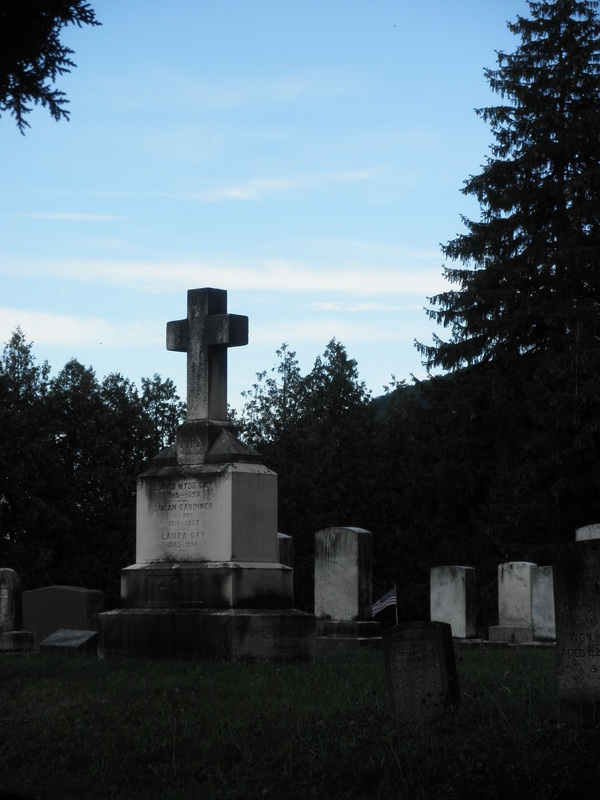 I love these peaceful walks through the cemetery, often right before dusk. It’s quiet and peaceful, surrounded by beautiful hills. My favorite section is the old section. 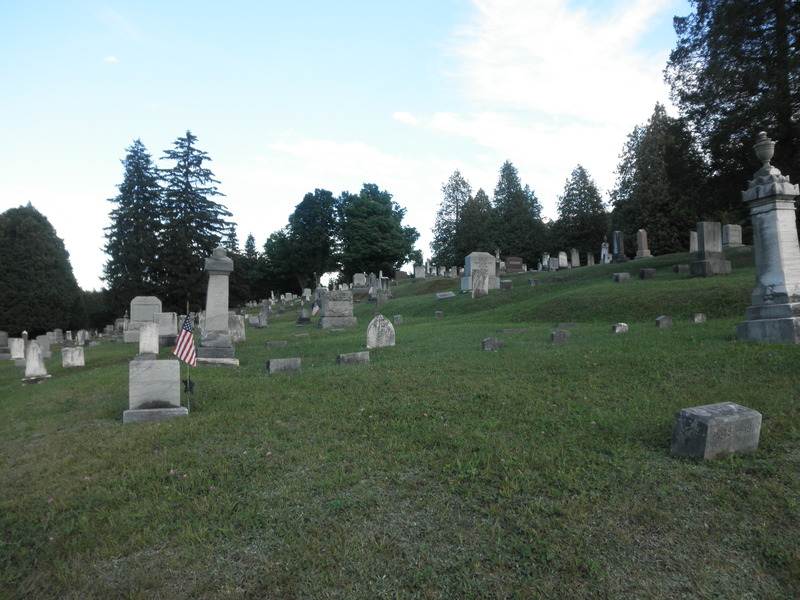 The gravestones of the first settlers of my town are located there, along with those of many of my ancestors. Some of the gravestones are truly beautiful. I really love the taller ones. 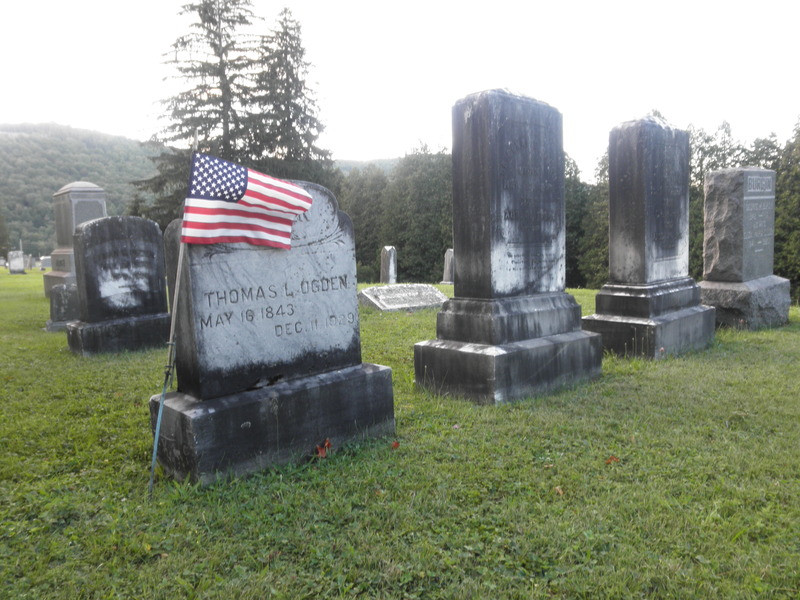 I believe Thomas L. Ogden was my great-great-great-uncle. Lyman B. Ogden was a talented artist. He was my great-great-uncle. I’ve been reading a book about the history of our small town. It’s been really interesting to learn more about the town that my family has lived in for centuries. 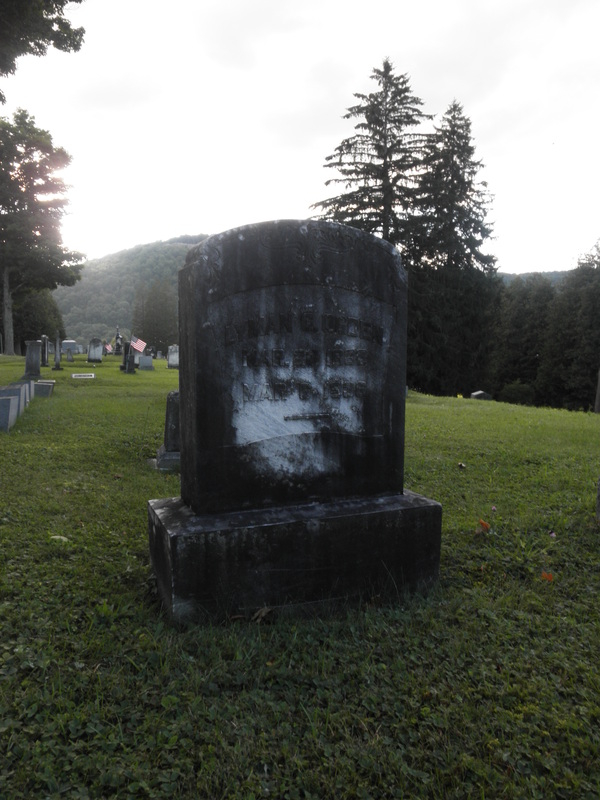 It’s been fun to see a gravestone in the old section and recognize it from the book. The book includes stories of many of the families and businesses. Many of these people gave up everything to take the hard journey into what was then wilderness to start a new community. They worked really hard to build their homes and later businesses. They created farms, built mills and tanneries, ran general stores, and cut down lumber to send down the river to Pennsylvania to the sawmills. It’s so hard to picture what my little town must have looked like so long ago.